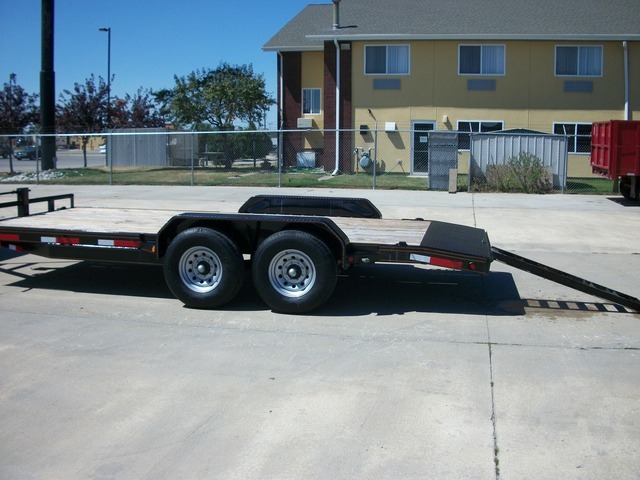 This trailer is a brand new 2010 Maxey Channel Carhauler 18' trailer! This trailer has 7k Dexter Electric brake axles with 5- leaf slipper springs suspension, 8 lug wheels, stake pockets, 2"x 3/8" rubrail, flushmount D.O.T. stop, tail and turn signals, electric break-a-way kit with charger, 10k spring loaded dropleg jack, safety chains, adjustable fulton type coupler, 7-way plug, 4 bull-nose D-rings, 2 3/8" piptop rail, 6" channel frame and tongue, 9" x 72" double broke diamond plate fenders, 2"x 8" treated wood floor, 4' dovetail, and more! This trailer is 18' long and 83" wide. We will consider any and all kinds of trades! We can also help with financing! So call 515-955-3399 with any questions!